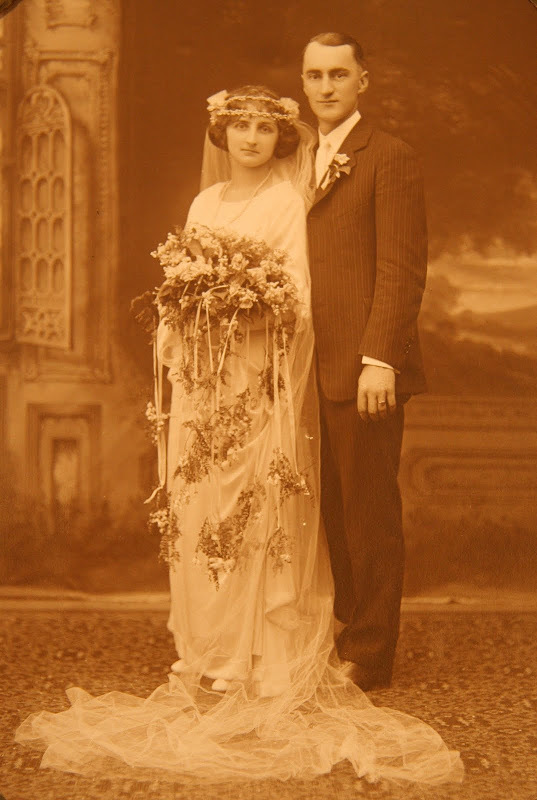 today's sepia saturday photograph is of my maternal grandparents from their wedding day - june 30, 1924. george was twenty-five when he married 17 year old mary - today we would say ol' george robbed the cradle! but it was a match made in heaven; mary and george were together until death did them part, in 1965, george died he was 66 years old, although mary was only 58 when george died, she never remarried. mary and george, who we called nana and 'dodo', had three children, rita, george, and rose marie. when I was a child I always felt there was magic in the number 3 when it came to my mother's side of the family. nana came from a family where her biological mother (julia) had three children; julia married josef, a widower who had three children (although one of these children died in childhood). my mom had three children and her sister had three children. although my uncle married, he never had children; he did have six nieces and nephews, all of whom he is close to. my grandfather, dodo, came from a family with six children (nothing more than 3 times 2). okay, enough of this nonsense - but maybe one more bit of 3 magic, I already mentioned nana lived to be 96 - but what I failed to also say is that when she died, along with her three children, she had six grand children and nine living great-grandchildren! last week I mentioned that this grandfather worked for some time as a miner. I don't know how long he was with the harwood coal company. but his time there was enough to help shorten his life; he qualified for a black lung pension (or whatever it is called) and eventually died from lung cancer. 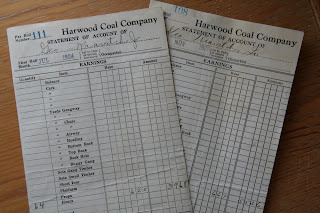 among the treasures I rescued from being incinerated when nana was going through her stuff in her later years are a hodgepodge of documents, including pay statements when my grandfather was with the coal company. at right are two showing what he earned in 1924 and 1926 (in 1924 he worked his rate was 62 cents/hour the wage increased to 66.7 cents/hour in 1926). do you know the song sixteen tons? 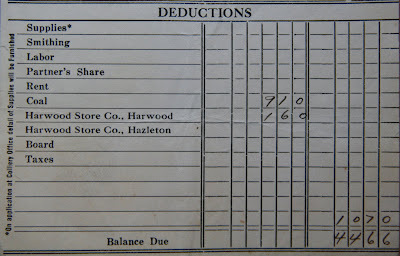 it has a line about 'owing one's soul to the company store; well this was really true, below is a snap of what is at the bottom of the 1926 pay statement. I always felt that my nana was the hardest working person I ever have known. in addition to raising her children, nana took care of many others including her in-laws when they became elderly and needed assistance. in addition to her family she cared for many people in her community. she worked outside the home as a housekeeper for many years. she was very involved with her church and community until she was 90. the only reason she had to slow down was because of a second hip fracture, this fracture happened three years or so after her first hip fracture and necessitated her having to finally move out of the home and community where she lived from 1924 until 1997. nana died in 2003 at the age of 96.
in addition to the prevalence of the magical number three, this side of the family also has a prevalence of 'women of the cloth' - my grandmother was a avid quilter - a passion shared by my aunt, my sister, a cousin, and me; along with quilting, most of the women in the family are skilled with the sewing machine and thread and needle. my aunt made a living as a dress-maker - her gowns were sights to behold. my mom made all of my sister's and my clothes when we were young. to this day if I am flummoxed by a sewing problem all I have to do is call up my mom and she helps me find my way out of the problem. I thought I'd post a love song that was popular in 1924 as today's tune. of course in the digital age, finding out what songs were hits way back when is just a click and a couple keywords away. it is pretty impossible to find youtube vids of songs from the 1920s; among the scores of songs listed as popular songs for 1924 on this website is indian love song. this version isn't by edith day, who made the song a hit when she played the title character in the 1924 operetta rose marie. go to kat's pad for to see the list of other sepia saturday players! What a handsome couple! You really don't notice the age difference in the photo, in fact, they resemble each other quite a bit in appearance. My parents had the Indian Love Call song in their wedding, too! Another great shot. My maternal grandparents were married the same year though they were 22 and 19. I actually still have some of their 78s from the 1920s. I probably should post some on Youtube. Slowly others are posting such gems. I can see why the number 3 had such relevance to your family. By the way that is one sensational wedding dress. I haven't heard the "Indian Love Call" for decades. I can remember it from the radio in the 50's. Music lasted longer in those days. This is a wonderful photograph of your grandparents. Your nana looks stunning in that dress. So sad that your nana eventually had to move away from her home and community after all those years. The same thing happened to my grandmother, and it's quite heart-breaking. Great photo - did you notice the sheer lace on your grandmother's dress? Wonder if it was hand-tatted? I love all the detail in your story - having the company store receipts is a treasure. I cannot ge tover how absolutely beautiful your grandparents were on their wedding day! That dress is heaven! My grandparents went to the justice of the peace and my grandmother wore an everyday dress, so we have no beautiful photos like this of their wedding day. Incredible photo! Wonderful family history--the magic three is quite remarkable. Love the wedding portrait! I just arriving after following a Sepia Saturday. I don't need to tell you that this photograph is gorgeous - as is the bride's wedding dress. Are you familiar with the work of Maureen Taylor, who specializes in the collection of wedding pictures and who is planning a book about them? This is such a wonderful picture. It makes one think they were wanting to be like movie stars. Her dress and flowers are over the top. Thanks for sharing it. what a wonderful woman she sounds - and its a lovely photo. do you have any of her quilts or bits of sewing? That photo is a wonderful family treaure. Glad you sved so many things from the ash heap. That dress is just stunning. What a gorgeous couple! Sorry, Kimy. I keep missing your Sepia Saturday post. When Alan gets back and my duties as links' recorder are done I'm sure that will change. George and Mary. The dress is gorgeous and he looks so dapper - like silent film stars. Isn't it wonderful to have these photos to bring our own histories to life?